Flopsy Girl and Yours truly have come to a decision. We are definitely not getting enough attention. Take last night for example. It was a full five minutes after the 2-foots came home before we were let out of our condo, and when we were let out, we were not groomed for anything like long enough. Then, to add insult to injury, we had to wait another five minutes for our food! The 2-foot with no fur on top of his head was snoring on the sofa again, whilst the other one cleaned out our condo HE SHOULD HAVE BEEN PLAYING WITH US! I think tonight, I may pee outside the litter tray and see if THAT get's their attention. Hello Dandy, oh dear things are not going well. Wee-weeing outside the litter tray ALWAYS works with us. As you had a not so good evening, guess you would not like to hear how fun ours was?? Oh I don't know, I need cheering up! Well, it seems that we are now all allowed to play together, Mister Jingles TiGgEr, Honeybunny, Bobbin and me but only under our 2foots supervision. 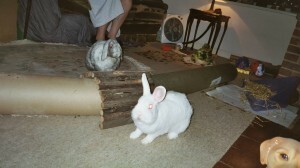 Myself, Mr J and TiGgEr are out all the time, but poor Bobbin and Honeybunny are in their hutches. Just think of all the bad habits that we can teach them, how to get attention etc. Good luck with the weeing. First visit very amusing, will certainly return.